During the hot summer months of July and August Koreans fight fire with fire! A beautiful Cornish hen is stuffed with short grain rice, garlic, jube-jube (date), ginseng root and lowered into a pot of boiling water. This simmers away for about an hour. Each are served a stone pot with your own chicken. 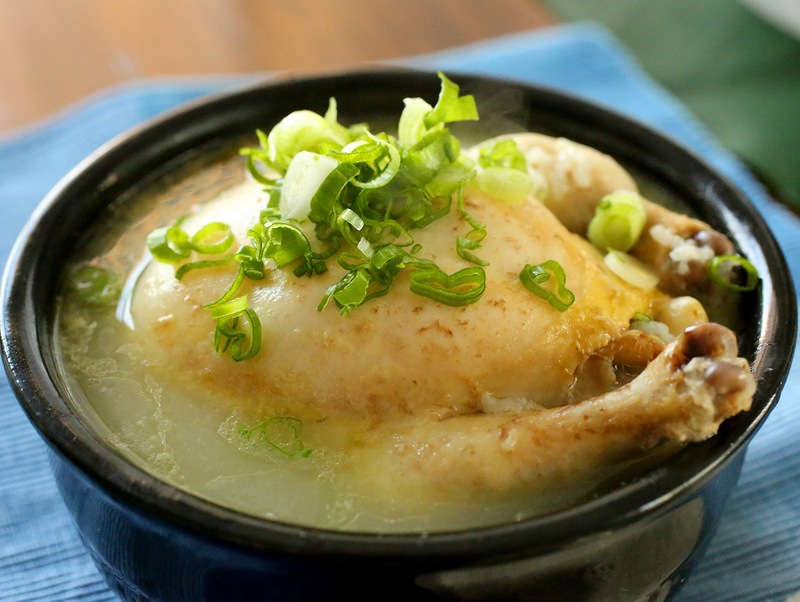 Break open the super tender chicken to reveal the sticky rice, garlic, jube-jube and ginseng root. The chicken and broth is seasoned at the table with salt and pepper. The broth is heavenly. Eating the now tender ginseng root revitalizes your entire being. On our last trip in 2014 the game was to see who could empty their stone pot completely. Cheers would abound as each person displayed their empty bowl! This meal is easily enjoyed by Americans because it is quite mild compared to some of the more exotic flavors we experience in Korea. I have made this at home and was thrilled with the results. As my chicken simmered I added sliced ginger to the broth to kick up the flavor. So easy and super yummy! Not all soups are served hot during the summer in Korea. Mul-naengmyeon is a soup that is served icy cold. We experienced a bowl of this at lunch with Master Ahn. A sweet and tangy icy broth served with chewy buckwheat noodles, radish and beef brisket. It was so unusual! I thought I was drinking a salad! 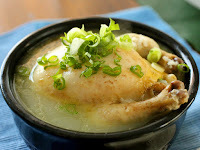 I am looking forward to our trip to Korea this coming week and enjoying an amazing meal of ginseng chicken. I will see you when I get back with exciting tales of Mrs. Pyke eats Korea!